In school cafeterias and gymnasiums, Acoustics In A Box™ panels are generally installed on the walls using down sloping, vertically oriented panels spaced about 2-8 feet apart on all walls where there is room to do so. If the room is especially "boomy" with heavy reverberation in the low frequencies, additional down sloping panels can be installed in ceiling to wall corners, and/or side sloping panels can be installed in wall to wall corners to provide effective bass traps that will go a long way toward curing the boominess of the room. Though many cafeterias and gymnasiums do not have accessible ceiling locations, if you do have a hard surface flat ceiling, installing additional panels on the ceiling, either ceiling sloping or hanging baffles, or a combination of both, can provide considerable reduction in the reverberation time of your room. One more thing: Acoustics In A Box panels are easily damaged if struck by a basketball or other object, and once broken, the panels perform their function very poorly. In sports venues like gymnasiums the simple solution is to buy a few extra panels so that you can replace broken ones when that inevitably does happen. These panels are quite inexpensive, especially when you consider the cost of alternative treatments. 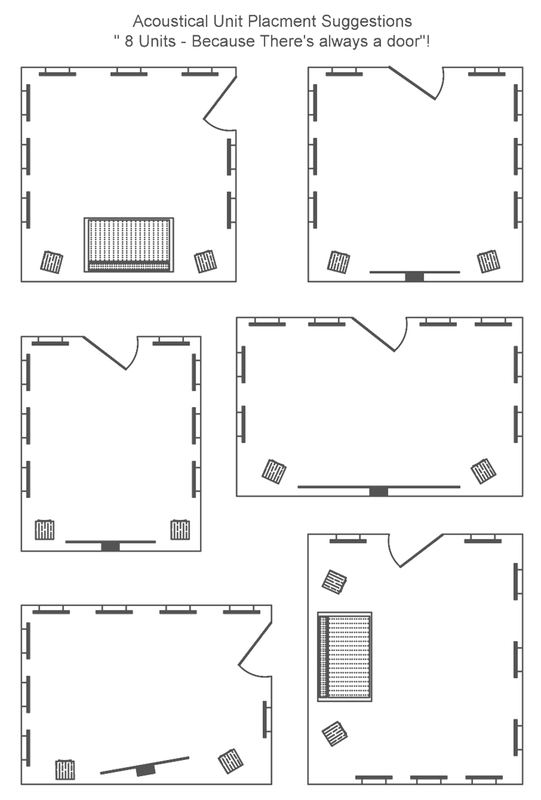 See some small room configurations to help visualize a typical Acoustics In A Box™ installation. For your room, the configuration will almost certainly be drastically different, but these sketches may help.